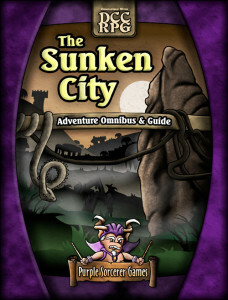 Every Sunken City Adventure In One Volume... Plus More! All four best-selling Sunken City Adventures (Perils of the Sunken City, The Ooze Pits of Jonas Gralk, A Gathering of the Marked, and Lair of the Mist Men) combined and refined into an enhanced full-color volume. Both a 96-page desktop/print version and a 200-page mobile version built from scratch for viewing on your tablet! A massive 84-page master appendix containing extra content, pre-gen characters, player maps, 1-inch scale battle maps, and over 150 paper miniatures. A patron write-up of Malloc, the devious master of secrets. At long last… Opossumen player characters. Adventure seeds, new monsters, 24 new magic items, judging tips, and more! Buy Now in PDF or PDF/Print Combo! Which Print Version is Best for You?